‘OLL-8’ | Florida Foundation Seed Producers, Inc. Description: In Florida, fruit of ‘OLL-8’ generally matures during the ‘Valencia’ harvest period. During some years, harvest can begin a few weeks earlier than ‘Valencia’, depending on weather. Fruit of ‘OLL-8’ holds on the tree exceptionally well, and maintains quality into the summer. 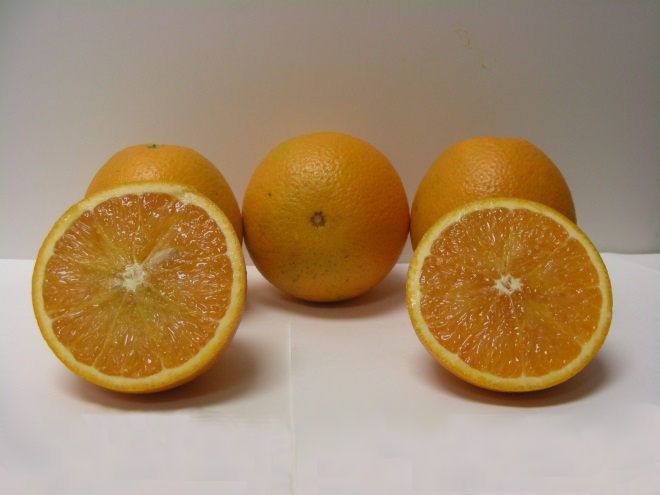 ‘OLL-8’ produces round oranges with internal and external color similar to that of ‘Rhode Red Valencia’. Although minimal formal yield data is available, trees appear to yield better than standard ‘Valencia’. The original ‘OLL-8’ tree yielded more than five 90lb. boxes of fruit (8-year old tree). ‘OLL-8’ fruit has high juice content and good pounds solids, generally exceeding 7 pounds per box on most common citrus rootstocks. ‘OLL-8’ peels easier and is less “raggy” than a standard ‘Valencia’, and with its added color, should also be a valuable addition to the Florida fresh market portfolio. ‘OLL-8’ was the most precocious bearing clone among the OLL (Orie Lee Late) somaclones. ‘OLL-8’ trees have shown good drought tolerance in the greenhouse, as overgrown trees in small pots rarely wilt as compared to other sweet orange seedlings, and field trees have generally shown better cold-tolerance than ‘Valencia’ trees in the same block. This apparent improved stress tolerance may be useful in the fight against HLB. Darryl’s Family Citrus Nursery, Inc.
K&C Farmer Citrus Nursery, Inc.
Orange-Co., a division of Alico, Inc.
Rasnake Citrus Budding and Growing, Inc.
50 North Lake Idylwild Dr.